Arched design for low clearance loads. 90 Days against manufacturer's defects. Call 1-888-546-4668 for complete warranty details and inquiries. The perfect solution to protect the cargo area in your vehicle from leaky grocery bags, garden supplies, mud-covered or wet sports equipment, sand covered beach gear. Great for dog owners and to carry debris, mulch, hay or construction gear. Designed for the cargo behind the front seats in SUV, Vans, and hatch back style vehicles, with the 2nd row seats folded flat. Dimensions: L 142cm x W 107cm. (adjustable +/- few cm for different vehicle brands). The liner turns the vehicle into a cargo vehicle to transport messy loads. The liner can be installed and removed in few minutes, it is not permanently attached to the vehicle and is supplied with all parts required for installation. The liner protects the back of the seats and the interior walls of the vehicle. It also protects the bumper when loading and unloading cargo and helps to prevent the users pants from getting dirty. It helps to preserve the resale value of your vehicle. The Liner is easy to store when not in use. Move your recreational vehicles or large equipment easily with these metal ramps. 600 lbs. maximum capacity per ramp. Raised tread allows for extra traction. Bright zinc plated finish. Not available in Quebec Market. Available in store by Special Order Only. See associate for details. Pair Tri-Fold Steel Ramps 9 In. x 72 In. 1000 lbs. per pair Erickson Manufacturing's TRI-FOLD Steel Ramp features an Anti-Skid surface. The arched design makes loading low clearance equipment easy. The 9" x 72" ramp folds twice for easy storage. Sold as a pair with a 1000 lb. rating per pair. 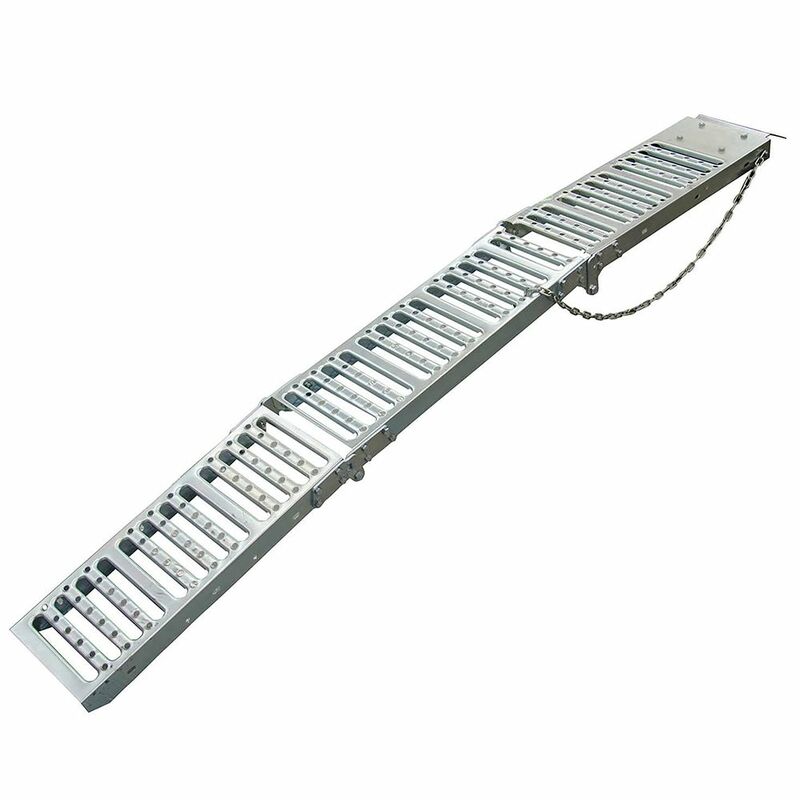 Each Ramp is secured by an attached safety chain. Pair Tri-Fold Steel Ramps 9 In. x 72 In. 1000 lbs. per pair is rated 4.3 out of 5 by 3. Rated 5 out of 5 by LB4391 from Great product Bought at start of winter to load and unload a snow blower from a Ford f150. Walk the blower up and down with ease. Ramps fold nicely for storage or transport and are strong enough for me to walk on with blower. Rated 4 out of 5 by Freakydee from So far so good I bought this to load my snowblower to take to the cottage and back. Easy set up and real sturdy. Doing the job. Rated 4 out of 5 by T Bone from Work great!! Bought a while back...strong and makes loading and unloading Lawnmower from the back of the truck a piece of cake...will use it for the Snowblower too. It would depend on vehicle height.